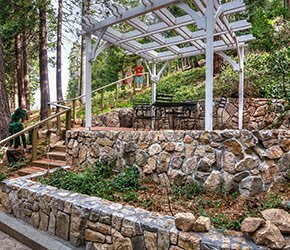 Located on the heart of the forest, surrounded by the scent of pine, cedar and dogwood trees and fresh, pure air at an altitude of 5,100 feet, Arrowhead Tree Top Lodge offers our guests an opportunity to rejuvenate and relax away from the everyday routine. The serenity and beauty of the natural environment here is unparalleled. 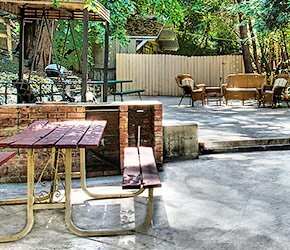 Our quaint Lodge is an excellent choice for your perfect getaway from the city, but not from modern conveniences. Our architecture is sensitive to the topography and integrates seamlessly into the existing natural environment. With the stunning scenery and wildlife comes a natural peacefulness. Whether you are looking for rest, relaxation, a romantic getaway from "the flatlands"or the thrill of being at one with Mother Nature and all she has to offer in our Nature Trail, you are sure to find it here at Arrowhead Tree Top Lodge. Our rustic alpine rooms are both comfortable and spacious. A true home away from home. Your stay will be extraordinary and relaxing. We will provide you with old-fashioned personal service. 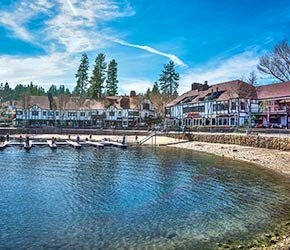 The beautiful Lake Arrowhead Village community offers countless recreational activities, such as hiking, backpacking, bicycling, lake tours, water and snow skiing, fishing, horseback riding, performing arts, galleries, fine dining, golf, and so much more!